This was my first attempt at a quilt with the snippets technique.The quilt is based on an idea I had for a quilt design to place behind a large dream catcher I had previously made. I used a postcard I had found of a canyon vista to aid in accurately building the canyon background. This fabric technique truly allows a 3-dimensional effect to occur as well as more flexibility to portray lighting effects like the sun going down and hitting the canyon walls in front of the woman standing in the foreground. This quilt is composed of thousands of tiny slivers of fabric that has subsequently been machine quilted with metallic threads. The Indian woman’s costume is embellished with suede, beads and a bird feather to further enhance the 3-dimensional appearance of the quilt. I framed the finished piece with a padded, fabric-covered wood frame in a complimentary pattern although if you look closely at the actual fabric , you will see it is a “circuit board” design print which I find rather ironic as the polar opposite to a nature design. This quilt measures 20″ square. 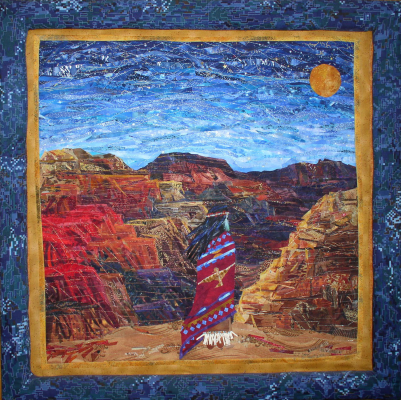 This quilt was finished on September 1, 2001 and the title was chosen before the tragic events that unfolded just 10 days later. For me,this quilt is a constant reminder of how the world should be seen versus what the daily news is constantly bombarding us with. Beautiful work. I felt like I could walk into the peaceful scene.